It's back!!!! Finally, after a few weeks without throwing up some trade bait, I have TMT back. One thing after another was taking away my time to get the post up. One would think I would take the time WHEN I HAD TIME to schedule a post. But that would require planning. Do I look like a planner? Anyway, let's get to the offering. Who remembers the rules? Here's how this works. I will post 6-ish cards each Tuesday. If you would like them, first to claim in the comments takes them. The cost for the cards is 1 (one) card off my want lists. It could be a need from my general wants, my A&G wants or something that I don't have in my bunting, double play, throwback, miscut or broken bats binders. You can find the cards currently in those in my Zistle account. Any card not shown is a card I want. Hey - if you would like to send me something for one of my active (or inactive) Projects that I don't have, that would be lovely too. Random White Sox and/or Blackhawks cards, however, are not allowed. Wow - I typed all that right off the top of my head. I'm remarkable. 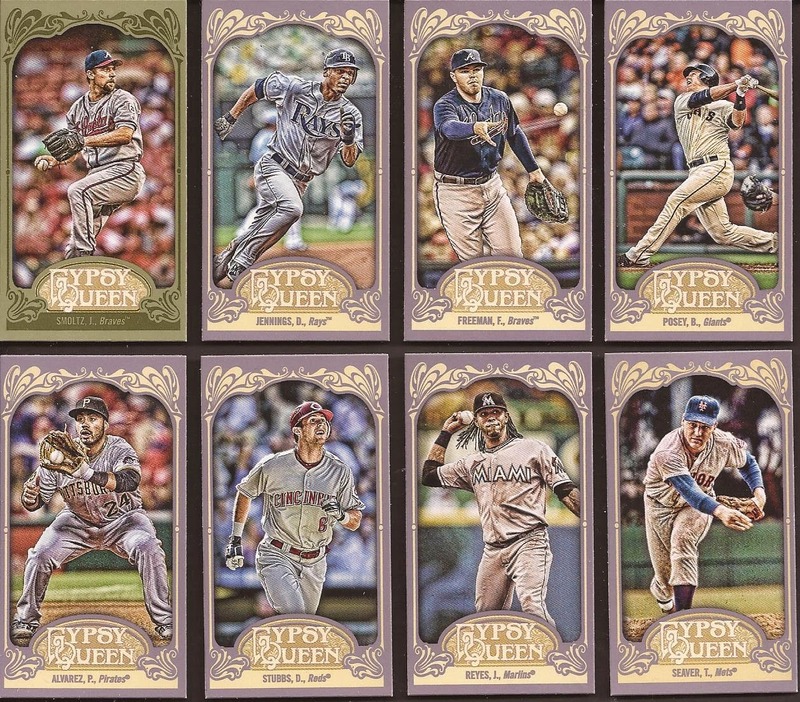 Anyway, the other day I saw a 2012 blaster of Gypsy Queen in the clearance aisle. Gotta take a chance, right? Ummm - no. I shouldn't have. Total bomb on the blaster. But my loss could be your gain. Those are all the minis from the packs. Yes, that Smoltz is a green border. Reyes is a red GQ back and you find Straight Cut backs on the Freeman and the Seaver. If these are still available, I'll take them off your hands. Thanks.